"ROAD to the OXFORD 250"
Oxford, Maine - Joey Doiron of Berwick outgunned Joey Polewarczyk of Hudson, New Hampshire Sunday afternoon in the 150-lap Pro All Stars Series North Super Late Model race, topping the card at Oxford Plains Speedway. Doiron, who also won a Super Late Model race the previous evening at his current home track, swapped the race lead with Polewarczyk on five occasions during the event. Polewarczyk had looked dominant through most of the distance, leading all but 11 of the first 140 laps. Tire conservation by Doiron played a huge role in the victory, with the eventual winner aided by a late-race restart that erased a three-second advantage held by Polewarczyk. Doiron led the final ten circuits to post the win, and earned a guaranteed starting spot in the rich, upcoming Oxford 250, scheduled for Sunday, August 27. Oakland's Mike Landry spent most of the race holding down the third position, but a late-race caution set up a green-white-checkered race finish and Landry managed to get past Polewarczyk for runner-up honors. Polewarczyk finished third, and consoled himself with the knowledge that he has a preferred starting spot in the August 250-lapper. Glen Luce of Turner and reigning PASS Super Late Model champion DJ Shaw of Center Conway, Ne3w Hampshire rounded out the top five. Tracy Gordon, Matt Swanson, Dave Farrington, Jr., Travis Benjamin and Reid Lanpher completed the top-ten rundown. Luce, Polewarczyk and Turner's Mike Rowe were Super Late Model heat race winners. Kyle Hewins of Leeds raced to an impressive win in a special, 25-lap Bandits race with a substantially-boosted purse. Hewins' closest rival at the finish was reigning division champion Jamie Heath of Waterford, bouncing back after bouncing off the frontstretch wall on the previous night. Scott Jordan of Auburn was happy with a third-place finish after racing with some of the best Bandits. Chachi Hall and Jake Hall, teammates from Oxford, completed the top five. Jordan and Hewins won heat races. Bryce Mains of Bridgton won his second Allen's Coffee Flavored Brandy Street Stock race of the weekend in Sunday's 20-lap special. Mains has won three times when points are not on the line this season. Tyler King of Livermore was the best of the rest in Street Stock action, with Mark Turner of Norway crossing the finish line in third position. Auburn's Mike Short and Shawn Knight of South Paris filled out the top-five rundown. Mains also won the heat race. Mark Theriault of East Milton prevailed in a competitive, 20-lap race for the Wicked Good Vintage Racing Association, winning aboard his 1963 Chevy II. Arthur Hannaford made a brilliant move in lapped traffic to earn runner-up honors on the final laps. Bobby Symonds of Casco passed a lot of car after being spun while up front and bounced back to finish third in his 1957 Chevrolet. Neil Martin of Freeport and West Paris racer Kevin Waterhouse rounded out the top five. The next Pro All Stars Series North Super Late Model event is set for Sunday, June 18 at Speedway 95 in Hermon, Maine. At Oxford Plains Speedway the Acceleration Series kicks off at 7:00 p.m. on Wednesday, June 14 and the Budweiser Championship Series featuring Super Late Models resumes on Saturday, June 17 at 7:00 p.m. For more information on OPS events call (207) 539-8865. Pro All Stars Series Super Late Model (150 laps) 1 73 Joey Doiron, Berwick; 2 20 Mike Landry, Oakland; 3 97 Joey Polewarczyk, Jr., Hudson, NH; 4 7 Glen Luce, Turner; 5 60 DJ Shaw, Center Conway, NH; 6 41 Tracy Gordon, Strong; 7 49 Matt Swanson, Acton, MA; 8 23 Dave Farrington, Jr., Jay; 9 7 Travis Benjamin, Morrill; 10 59 Reid Lanpher, Manchester; 11 73 Adam Polvinen, Hebron; 12 12 Derek Griffith, Hudson, NH; 13 1 Jeremy Davis, Tamworth, NH; 14 4 Ben Rowe, Turner; 15 71 Gary Drew, Casco; 16 48 Bobby Timmons, Windham; 17 94 Garrett Hall, Scarborough; 18 2 Chad Dow, Pittsfield; 19 53 Cole Butcher, Porters Lake, NS; 20 54 Johnny Clark, Farmingdale; 21 97 John Flemming, Halifax, NS; 22 2 Lonnie Sommerville, Barnesville, NB; 23 32 Steve Murphy, Woburn, MA; 24 29 Greg Fahey, St. Stephen, NB; 25 16 Travis Stearns, Auburn; 26 50 Jeff White, Winthrop; 27 24 Mike Rowe, Turner; 28 12 Joseph Graf, Manwah, NJ; 29 61 TJ Brackett, Buckfield; 30 51 Eddie Fatscher, East Northport, NY. 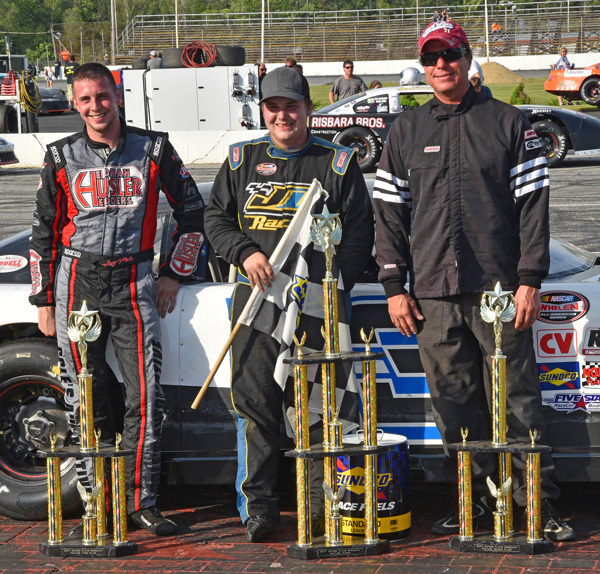 Bandits (25 laps) 1 51 Kyle Hewins, Leeds; 2 91 Jamie Heath, Waterford; 3 36 Scott Jordan, Auburn; 4 3 Chachi Hall, Oxford; 5 5 Jake Hall, Oxford; 6 1 Brandon Varney, Auburn; 7 17 Dan Wade, New Gloucester; 8 13 Bill Grover, Waterford; 9 29 Tom Harwood, Derry, NH; 10 77 Rob Crepeau, Minot; 11 95 Eric Stoddard, South Paris; 12 55 Dean Jordan, Jay; 13 68 Eric Parlin, Mechanic Falls; 14 24 Travis Verrill, South Paris; 15 53 Chad Wills, Oxford. Street Stock (20 laps) 1 77 Bryce Mains, Bridgton; 2 11 Tyler King, Livermore; 3 09 Mark Turner, Norway; 4 11 Mike Short, Auburn; 5 5 Shawn Knight, South Paris; 6 27 Patrick Thorne, Standish; 7 0 Richard Mains, Naples; 8 99 George Haaskett, Casco; DNS 8 Keith Stuart. Wicked Good Vintage Racing Association (20 laps) 1 73 Mark Theriault, East Milton; 2 71 Arthur Hannaford, Hollis; 3 82 Bob Symonds, Casco; 4 1 Neil Martin, Freeport; 5 11 Kevin Waterhouse, West Paris; 6 48 George Harding, Benton; 7 97 Brian Hughes, Otisfield.